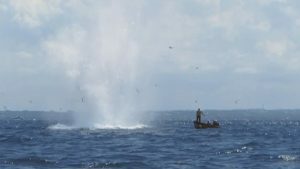 Blast fishing is one of the most destructive fishing techniques in practice today. The impact on the environment through this technique is phenomenal. Regardless of the negative implications and the banning of the technique in many countries, it continues to be one that is used significantly. The technique makes use of dynamite and explosives, often homemade varieties. The explosives are detonated around reefs where many species of fish find their solace. On detination the fish are killed instantly. They float to the top where fishermen wait to scoop them up. The area affected by just one explosive device of this nature is mind-blowing. Besides the cruel nature of the technique, the devastation to the coral reefs, the natural habitats and the delicate ecosystems is considerable. Continued use of this method will wipe out entire species in the future. Humans are the biggest threat. In a world where prices are always on the rise, finding more profitable ways to fish is inevitable. Explosives used for blast fishing are fairly inexpensive and the large quantities of fish yielded from each expedition is astounding. The price offered for the fish outweighs the cost of the explosives ten-fold. Regardless of the hazards encountered with such a technique, the profitability is what drives the fishermen to explore this option. Explosive techniques yield far larger catches than any other means of fishing and thus the appeal. Awareness over the implication of blast fishing is becoming more widespread, however, it is uncertain whether this will have a meaningful effect on the practice of the technique. One thing is certain, blast fishing will have to be dealt with for a number of years still before it eventually dies out. By that time it may be far too late for the reefs and the ecosystems that rely on it.